It's Johnson's fourth straight Pro Bowl invite and the third in four years for Suh. 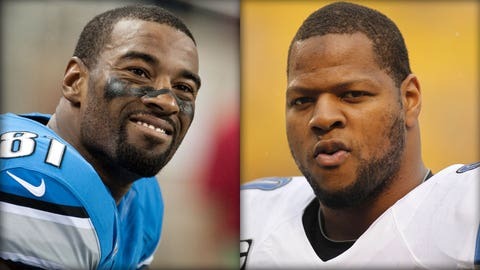 Receiver Calvin Johnson and defensive tackle Ndamukong Suh are the only Detroit Lions players who were selected to play in the Pro Bowl. It’s Johnson’s fourth straight invite and the third in four years for Suh. Three other Lions ‘ quarterback Matthew Stafford, running back Reggie Bush and defensive tackle Nick Fairley ‘ were named as alternates and could be added to the roster in place of players who are injured or participating in the Super Bowl. Linebacker DeAndre Levy, offensive guard Larry Warford and center Dominic Raiola probably weren’t helped in the voting by the Lions’ late-season collapse. The Pro Bowl will be played in Honolulu on January 26, a week before the Super Bowl.